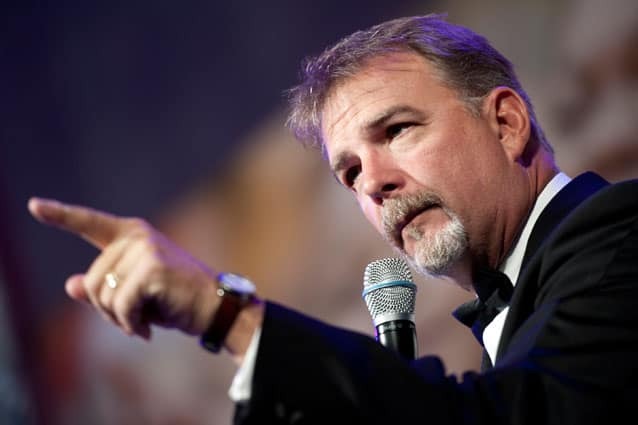 Sunday, Nov. 23 at 5 & 8 p.m. — RUTLAND — The Paramount Theatre presents Bill Engvall, top comedian and star of the sketch comedy show, “Blue Collar TV,” in two performances on Sunday, Nov. 23; 5 p.m. and 8 p.m.
Bill Engvall is a Grammy nominated, multi-platinum selling recording artist and one of the top comedians in the country. Most recently, Bill was a contestant on season 17 of ABC’s “Dancing with the Stars,” and as a fan favorite, he made it to the finals. Earlier this year, Bill lent his voice to the animated comedy series “Bounty Hunters,” which aired on CMT. He previously starred in, and executive produced, the TBS sitcom “The Bill Engvall Show.” Bill was part of the enormously successful Blue Collar Comedy concert films, which sold over nine million units and received a Grammy nomination. He also starred on the WB’s hit sketch comedy show “Blue Collar TV” and in several solo specials for Comedy Central. In 2012 he reunited with Jeff Foxworthy and Larry the Cable Guy on the “Them Idiots Whirled Tour,” which aired as a special on CMT. A native of Galveston, Texas, Bill moved to Dallas and worked as a disc jockey with plans of becoming a teacher. While in a nightclub one evening, he tried his hand at stand-up comedy and found that making people laugh was truly his forte. Soon after, he moved to Los Angeles and went on to star in the Showtime special, “A Pair of Jokers,” hosted A&E’s “Evening at the Improv” and appeared on “The Tonight Show” and “Late Show with David Letterman.” In 1992, Bill won the American Comedy Award for “Best Male Stand-up Comedian.” He appeared in several episodes of “Designing Women” and co-starred in “Delta” and “The Jeff Foxworthy Show.” Bill resides in Southern California with his family. Tickets, starting at $39.75, are available at the venue box office located at 30 Center Street, Rutland; by calling 802-775-0903 or online at www.paramountlive.org. For more info, visit www.billengvall.com.